Uglyworld #489 - Mind Over Matter (126-365), originally uploaded by www.bazpics.com. With the debate raging on over who would be coming to Scotland with us tomorrow, it took me a while to realise that Jeero wasn't anywhere to be found. I asked if anyone had seen him and Ice-Bat told me that he had been watching some magic program on TV during the day and wanted to see if he had any magic skills of his own. I found him in the kitchen standing beside the table, with a tablecloth on top of it (just like he had seen on the TV program) and a glass bowl sitting right in the middle of the table. 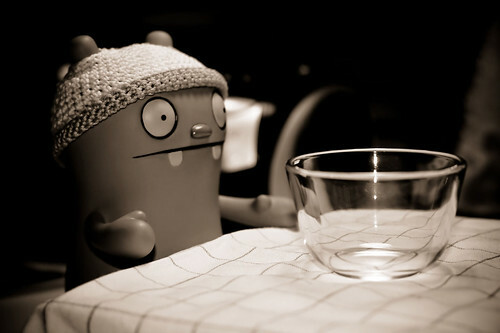 Jeero was making all kinds of weird "nnnnnnnggggggg" noises etc as he concentrated every single iota of energy in his body through his eyes at the bowl. During a quick break as he took time to blink he informed me, "I can makes this bowl flies, but I thinks its been groundeds by air traffics control, is there more of those volcanic dusts agains?". It appears the mentally inept little guy wants to try and make the bowl levitate, I must admit it was pretty damn funny to stand there watching him for a few minutes, and the only time the bowl would move at all would be when he'd stamp his foot or accidentally bump into the table in a fit of anger at it's decision not to "fly". At least it's keeping him occupied and out of my way as I have 2 cases to pack tonight!